To do this, the architects wanted glazing that was both visually striking but also energy- efficient and Pilkington Planar™ fitted the bill. Approximately 500m2 of laminated Pilkington Planar™ was specified incorporating Pilkington Planar™ Sun 70/39 coating. 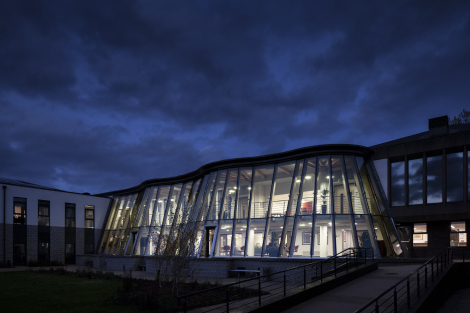 James Elliot of GSSArchitecture said; “GSSArchitecture specified Pilkington Planar™ incorporating a soalr control coating on a geometrically challenging façade to provide a contemporary look that would limit solar glare as well as overheating. Pilkington Planar™ systems remain the world’s market leader for structural glazing systems. With its unrivalled stability and safety, this innovative product allows architects to build entire structures out of glass.